Growing up with a deaf father, Professor Graeme Clark grew up seeing the hardship of living in silence - including the frustration, anguish and resulting isolation. He also witnessed his father’s desire for a greater connection to others, and was determined to make it possible. 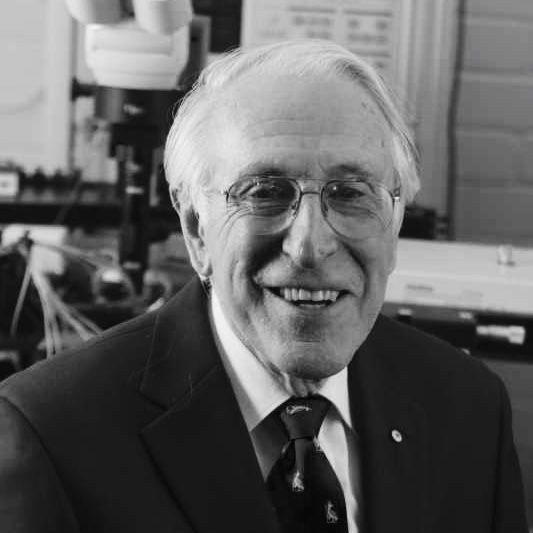 Though creating an implant seemed like an impossible task, Professor Clark dedicated years to its research and development. His colleagues insisted that a cochlear implant wouldn’t work because the inner ear was just too complicated. Is hearing loss a worldwide problem? Loss of hearing is a major problem. For example, there are nearly four million people in Australia who have a hearing loss at a level that is considered a disability, and the incidence will increase as people get older. Furthermore, deafness is more common in the lower to middle income group. Even with the best hearing aids or cochlear implants, communication in noise is difficult. What problems do young children face if they have hearing loss? Young deaf children have difficulties in learning and the use of language. They cannot achieve their true potential and it impedes their social development. What problems do adults face if they have hearing loss? Deafness contributes to loneliness and loss of occupation in adults. Many adults no longer feel comfortable in the world around them. Some jobs are particularly difficult for them which include management, teaching, entertainment and many others. Apart from impacts on individuals and families, what does hearing loss mean for the broader society? e.g. people dropping out of workforce/productivity issues? It has been estimated that deafness costs billions of dollars in lost productivity. What inspired you to become an ear surgeon? My father had a severe hearing loss which was an embarrassment to me as a child and at the age of five years I said to my kindergarten teacher, Pat Coleman, I want to fix ears. This meant that instead of aspiring to be a steam train driver like my classmates I surprised my Methodist minister by saying at the age of 10 I wanted to be an ear doctor. To be sure that I would make the grade my father sent me for IQ and aptitude tests and they confirmed that medicine would be suitable. But in 1946 they said I should consider the new discipline of electronic engineering. At the time, I also inspired to do biological research after reading the life of Louis Pasteur. It really lit “a fire in my belly” to discover new things, and so I carried out experiments in my mother’s laundry. In developing hearing through bio electrical stimulation of the auditory nerve and brain there were many obstacles to overcome. I felt I was always breaking new ground. Firstly, I could only test my new ideas to see if they were practical if I had facilities and money. This was made difficult as at least 95% of scientists and clinicians around the world did not think that what I was embarking on was possible. Some of them referred to me as 'that clown, Clark’ and even hinted that I should be relieved of my position at the University of Melbourne. A second obstacle was safety – some senior surgeons had said I might kill my patient. Furthermore, I could not pass a bundle of wires around the tiny spiral of the inner ear to make contact with the all-important speech frequency regions to be stimulated on a place coding basis. This was resolved when I found grass blades that were flexible at the tip and stiffer at the base would pass around the cochlea. There were many other obstacles such as the recruitment of patients, and developing the electronics. What sustained you when facing these challenges? I was sustained through all the difficulties and crises by a supportive wife, prayer and encouraging friends. I was also sustained by a determination to show that it would be possible against all the odds. Tell us about the moment you knew it had worked? After surgery in 1978 there were some worrying moments when Rod collapsed due to a fainting spell. Then later on two occasions when the wound had healed he heard no sounds with electrical stimulation. This was however resolved when the engineers found a loose connection in the electronics. Then when he heard sounds for each electrode that were different from the whistling noise in his ears we knew that at least all electrodes were functioning. But did he get different pitches when stimulating each electrode? This was the $64,000 question I had staked my whole career on. The whole basis for multi-channel stimulation was to give speech understanding through taking advantage of the place coding of speech frequencies. Towards the end of 1978 I had to find a speech code that would work, and enable Rod to communicate even without lip-reading assistance. So, it was exciting to find that stimulating different sites not only gave tonal sensations which varied from sharp at the high-end frequency of the cochlea to dull for the electrodes at the low frequency end of the cochlea, but, that was still not good enough to convince the sceptics. Then while testing Rod further, he experienced the tones as vowels. Having worked with Bill Ainsworth at Keel University in 1986 on formant speech processing and Bruce Millar at the Australian National University it became evident that these especially important resonant frequencies called formants were perceived as vowels and were linked to the conscious experience of speech. This was the first time that speech elements were perceived through electrical stimuli and paved the way for coding more information to get through the “electro-neural” bottleneck for speech understanding. When this happened, I was overcome, and went into the next-door laboratory and cried tears of joy. It was then that I realised that all the years of blood, sweat and tears were successful. In view of this exciting result the Australian government supported the Australian Pacemaker firm Telectronics to develop it industrially through the creation of the subsidiary Cochlear, which has for more than 30 years had the lion’s share of the world market. In fact, the Cochlear bionic ear was the first to be approved by the US Food and Drug Administration for severely to profoundly deaf adults in 1985. Then in 1990 it was the first implant of any type to be approved for use in children and has given them spoken language. Can we expect more exciting developments in hearing health? We can now expect to use advances in computer processing power and miniaturisation to select a greater number of speech patterns from speech in quiet and in noise for better speech understanding. These patterns can be presented as find temporo-spatial stimuli to the nervous system using multiple electrodes made using nano technology (which could lead to mapping the brain and other breakthroughs in neuroscience!). Software capability will also enable learning to modify the stimuli to the auditory nerve for clear hearing. Nano technology will also enable cochlear implants and hearing aids to detect movements of the ear drum and convert them to hearing stimuli so that we have “invisible devices” powered by implantable batteries or biochemical reactions. Do you often meet cochlear implant recipients? Do you have any favourite stories? I am frequently in contact with cochlear implant recipients, particularly those who write and share their experiences. But, there are so many now who have the device it is not uncommon to meet them socially. I am most moved by the children who recount how it has changed their lives. For example, I agonised over whether to operate on Sian Neame who at two years of age with just a little residual hearing was to be, in 1990, the youngest patient in Australia to have an implant. I don’t regret the decision to operate as her hearing and language improved dramatically, and at age 12 she was able to meet Queen Elizabeth II and Prince Philip on their formal visit to the Bionic Ear Institute in 2000. Then later she opted to have an implant in the other ear so she could hear bilaterally and she said that was the best decision she had ever made. Given that many countries' populations are aging, what do you say to older people who could benefit from a cochlear implant, but might be unsure about getting one? If someone is a senior citizen and has an implant I can now tell them with some confidence that if their hearing loss is severe they should have a multi-channel cochlear implant. People who are physically fit have had one successfully implanted in their 90s and it can mean such a great deal and allow them to communicate with friends and take an interest in their grandchildren and in fact it gives them a new life.